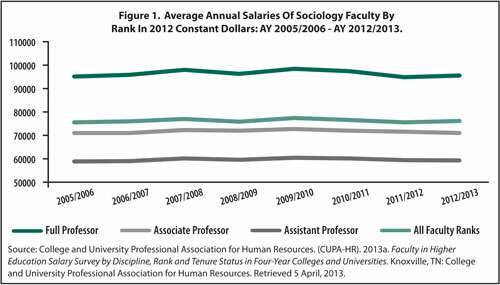 With state legislatures squeezing higher education budgets, sequestration’s impact, and faculty roles in shared governance and unionization appearing to be decreasing, it is not surprising that faculty salaries in sociology and other social sciences remained mostly flat between Academic Year 2011/12 and 2012/13. As detailed in the ASA Research Brief, Some Sociology Faculty Salaries Edge Up, for many faculty members salaries did not increase above the rate of inflation. By comparing annual salaries with the annual inflation rate of a market basket of goods, we can measure salary in constant (or inflation-controlled) dollars. When comparing 2012 salaries with the rate of inflation, our data show that for most ranks of academic sociologists and other social science faculty they broke even in the 2012/13 year. Overall, average faculty salaries across disciplines increased at the rate of inflation. These findings are more encouraging than those for the two prior years, during which salaries for all faculty members were less than the rate of inflation. The ASA Department of Research on the Discipline and Profession has published changes in salary data in current and constant dollars since AY 2005/2006. We use data from the College and University Professional Association for Human Resources’ annual Fac�ulty in Higher Education Salary Survey by Discipline, Rank and Tenure Status in Four-Year Colleges and Universities (CUPA-HR 2013) because these data are available by discipline, rank, and type of institution of higher education. Between AY 2011/12 and AY 2012/13, sociology faculty salaries in current dollars increased (as they did for all disciplines studied in the brief). The average salary at $75,580 (in current dol­lars) earned by surveyed sociology faculty in AY 2012/13 was 2.8 percent higher than the average salary for AY 2011/12 (see Table 1). There was an 18.4 percent increase since 2005/2006, when the average salary was $63,846 (see Table 1). Average salaries for the full, associ­ate, and assistant ranks in sociology increased between 1.3 percent and 2.8 percent since AY 2011/12, with full professors (at a 2.8% in­crease averaging $95,052 in AY 2012/13) being the only rank that exceeded infla­tion. In contrast, salaries for associate professors increased by the smallest percentage (1.3%), and assistant professor salaries increased by 2 percent. The picture is quite different when looking at 2012 constant dollars. 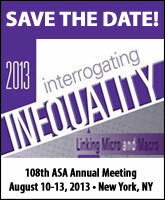 Pur­chasing power for all sociology faculty members increased on average by 0.7 percent or $523 in constant dollars. With the exception of the assis­tant professor rank in sociology at public institutions, average salary increases in current dollars from AY 2011/12 to AY 2012/13 were markedly greater for private institutions compared with public institutions. In current dollars, average salaries increased for all ranks at private institutions by 4.6 percent, compared to 1.9 percent for public institutions. The greatest salary increase in cur­rent dollars between AY 2011/12 and AY 2012/13 occurred for full professors at private institutions, at 5.6 percent and 3.5 percent in constant dollars—greater than the rate of inflation. Salaries among academics in economics are generally the highest, while pay scales for the other disciplines studied tend to be similar to each other. The percent change in average salaries between AY 2011/12 and AY 2012/13 for all faculty levels was essentially the same for economics and sociology, and lower for political science and anthropology. Although the recent year’s percent changes in salaries between sociology and economics in constant (inflation-controlled) dollars may be equal (0.7%), the average salary differ­ences between these two disciplines is more than $25,000 in 2012 dollars. 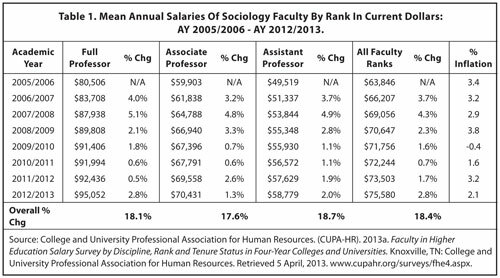 Regardless of the percentage changes in salaries among the disciplines, sociology faculty salaries are the lowest, on average. The CUPA-HR data show that average annual sal­ary changes between AY 2011/12 and AY 2012/13 reflect slow or no growth, especially in salaries at public institutions compared with private institutions. The only discipline among public institutions that did not experience a negative change in salaries over the past two years was economics, when controlling for inflation. At a time when there are concerns over the capacity of public institutions to recruit and retain suit­able candidates for academic positions at all ranks, the difference between salary levels at private and public institutions may be especially worrisome.